When taking photographs, considering the light is very important. It can highlight your work or wash it out. Learning to watch and work with its changes can help you produce better work. Here patience is a virtue! Once again, I don't know how photographers manage to record the exposure/shot details, but Peter Watson has, and one can learn from these recordings. Most of the time when we look at photographs we have no clue as to the pains some photographers go to. Some plan for days or weeks ahead, others sit for hours at a time, others use filters and gadgets, and some shoot from the hip. This is how Watson, in part, describes one scene: "The sweeping wall and fence are so marvellously embellished by the perfectly positioned tree that together they create an appealing image whose charm transcends the humble nature of its content". That's the thing about "art" - it's so subjective, and Watson agrees whole-heartedly in Chapter Four (the text on page 111). To me, this particular picture (not his photograph per se) is rather blah in terms of composition. Photos of his I did enjoy are on these pages: 23, 25 (my backyard), 53, 59 (clever use of a polarizing filter), 63 (complicated shot details), 86, 125 (gorgeous), and 175. Watson takes us on his travels and he eloquently relates how he got each of the featured photographs. Most of them don't just happen - he knows what he wants and has patience. If you don't have time to wait for the light to change to your preference, you won't be happy with what you shoot. Many of his photos were taken using a neutral density filter which helps to prevent over-exposure in skies, and/or using a polarizing filter to prevent reflection (water and windows) and to enrich the subject. 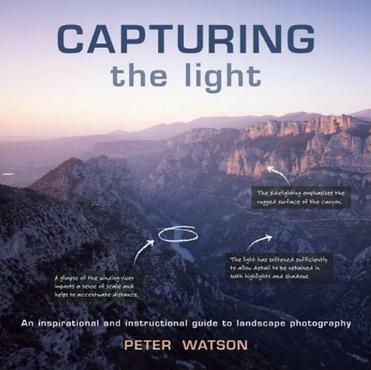 Interestingly, and good for the novice photographer, Watson also includes a couple of his not-so-perfect photos with explanations of what he did wrong. In his opinion. Conclusion - Beautifully simple to grasp. Essential reading for all photographers.